A Shropshire legal firm is offering a new service to help make selling a home easier and quicker. 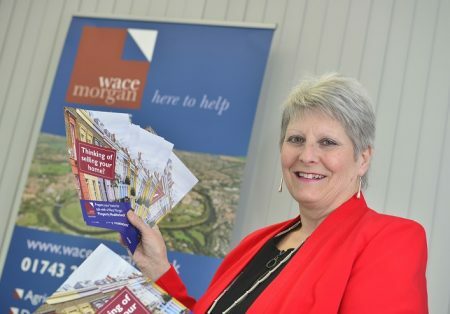 The conveyancing team at Wace Morgan Solicitors, based in Shrewsbury, is providing a ‘property healthcheck’ for clients. Residential conveyancing executive Sue Cornish, who has over 30 years’ experience in the sector, says that the service will smooth the home selling process. “This is the time of year when a lot of people are thinking about moving and more properties are going on the market,” said Sue, who specialises in freehold and leasehold residential sales and purchases and associated matters. “It can be a stressful procedure but we are encouraging people to use our property healthcheck. “This means that we carry out a review of their property’s title, ensure that any deeds to an unregistered title are obtained in good time and advise whether to apply for a voluntary registration of the title prior to the sale. “We also check that all the necessary planning and building regulation and consents for any work are in place and see that all rights that benefit the property are properly recorded in the deeds. “By investigating all this we hope to cut down on the number of enquiries at a later stage and so simplify and speed up the selling process, making life easier for all parties,” Sue said.